‘The introduction of trousers was a first for the airline and probably a world first as well.’ History curator Lynette Townsend talks about her favourite Air New Zealand uniform from the 70s. A gallery that acts as an air bridge featuring uniforms is a stylish nostalgia trip at the beginning of Air New Zealand 75 years: Our nation. The world. Connected. The latest Trelise Cooper designed uniform begins the walk back through time, and the first military inspired uniforms worn in the 1940s take pride of place at the end. It’s hard to pick a favourite but if I had to it would be NAC’s 1976 red, white and blue ensemble. The bold hounds tooth pattern reflects 1970s style but the colours reflect NAC’s (National Airways Corporation) corporate colours. 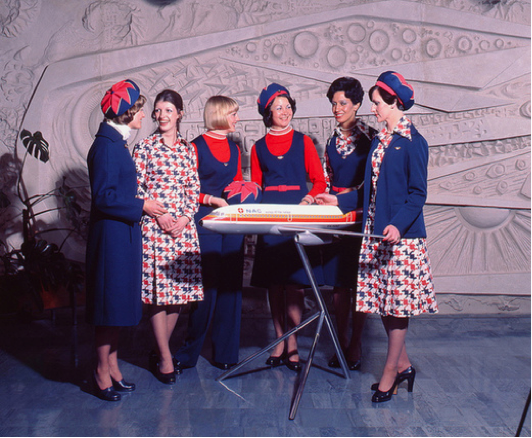 Like Air New Zealand’s current uniform there were several options for female staff to choose from – two different dresses, or a tunic and trousers. The introduction of trousers was a first for the airline and probably a world first as well. Like many of the uniforms on display this one both reflects and was inspired by the fashion of the era. In the 1970s trousers were a must have for any fashion conscious woman but what I like the most is the cute hat. Other 70s uniforms are equally compelling. 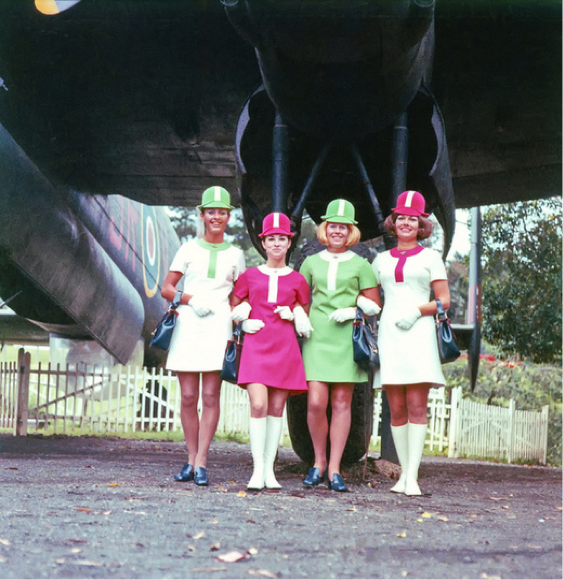 The nicknamed ‘Lollipop’ uniform, worn by NAC crew between 1970 – 1976, were specifically designed to get young people flying. The white boots were a hit with the ‘hostesses’ but the short Mary Quant inspired dresses could be a bit problematic at times, especially when tending to the overhead lockers. A third uniform introduced in 1973 by Air New Zealand is equally remarkable. Designed by Auckland based Vinka Lucas, the new uniform came in just as the airline launched its Koru logo. It featured a bright yellow blouse with a Maori inspired motif on the sleeve which tied in well with the airlines desire to express a sense of New Zealandness on the international scene. Lucas, known for her flamboyant luxurious evening gowns, was an ideal choice of designer. Popular with a glitzy crowd of New Zealand women, her style particularly appealed to the jet set – the wealthy few who could afford the luxury of international travel. This uniform was only worn for three years (1973 – 1976) perhaps because of the impossible buttons that adorned the sleeves and ran up the back of the blouse – they couldn’t be undone without help! Even so, this uniform completes a remarkable 1970s set. I might add my girlfriend Leanna Hetherington recently visited TePapa with our mutual friend & local Marie Jefferson. To their delight whilst scanning the uniform through the ages book, came across a large portrait of the three of us strolling the tarmack adorned in the Air NZ uniform designed by Isabell Harris. I have a couple of shots in my archives of that same day. I remember we had to be on set at something like 5am to get the sunrise in the background. Yes a proud moment in History! 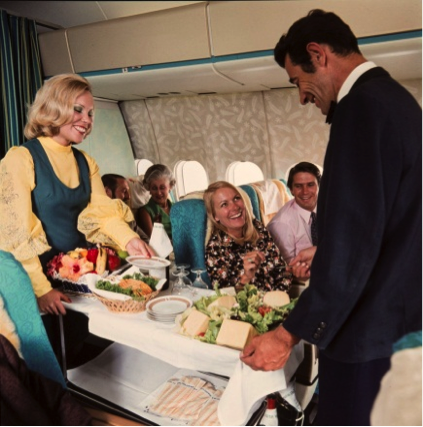 It interests me a great deal to see more uniform blogs through the archives of Air NZ. I myself modelled & was part of the exciting moment when Thornton Hall’s head designer Isabell Harris was given the opportunity to design & later conquer with her classic design’s that won over other competition in the early 90’s under the umbrella of Hall Manufacturing. I remember the nerve racking task of parading the different pieces infront of a panel of scruitineers. I did like the ruffled over pinny for serving food & beverages that buttoned at the side. Isabel kept is classic & simple for which shone over her competitors hands down. Great to hear from you and very exciting to find out a little more history around the Isabel Harris uniform when it came out. It sure was an absolute classic. Airline uniform truly reflected the fashion of the times. I still love the mini. The lollipop look certainly was a stand out.